You can take your parrot out safely in the summer (or winter) by putting a harness on her. Outings can last up to 4 hours and duration should be guided by your parrot, who'll probably let you know when she's had enough. When I take my two African Greys, Artha (18) and Casper (16) into town I can get stopped and asked, ‘Are they real?’ They always sit quietly on a shoulder each. Sometimes parrot owners tell me,’ I have tried to harness my parrot - he hates it; it doesn’t work.’ But it can and should work. 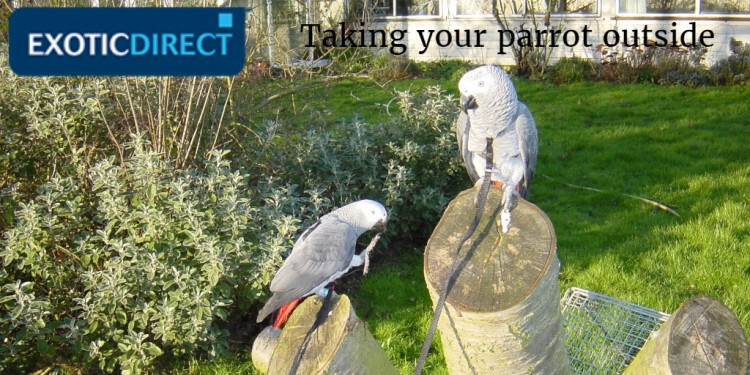 How long can you take your parrot outside for? Be guided by your parrot - she may start nipping your when she's had enough. You can take a parrot outside, by putting a harness on her. Using a harness on pet parrots is still a comparatively unusual activity. 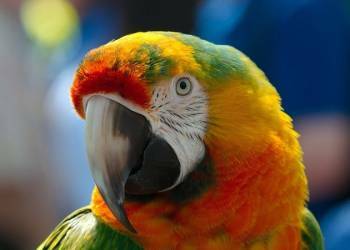 Read the opinions for and against of parrot experts and trainers Steve Martin, Rosemary Low and Barbara Heydenreich. How can I harness train my bird? First stage is to get the bird used to the sight of a harness. Arrange training sessions before feeding time. Keep them short and always end on a positive note. Choose a harness in a shade that echoes feather colour. It helps if your bird is already clicker trained. I like to start with using a couple of strips of ribbon - the same colour as the harness. Lay them across the bird’s back and if she accepts, use your clicker or bridge word like “good” or “well done” and give the treat. Let the bird set the pace. If she accepts the ribbon on her back for 2 seconds before tossing it off, click and treat her. Gradually she will let the ribbon remain for longer. You can then try with two pieces of ribbon laid across her back. This habituation can take anything from a few days to a few weeks. Just don’t hurry - so long as it remains fun for the bird and not stressful. Watch her body language – is she interested and eager or are her feathers fluffing and is she leaning back to avoid you? When she has accepted the ribbons, slowly accustom her to the harness. Let her see the harness and beak it perhaps, and be given a treat. The more eager your bird is to “work” for the treat, the easier it will be to accustom the bird to wearing a harness. If you have taught your bird to touch a target stick, you can hold the stick outside the neck loop and encourage the bird to put her head through the enlarged loop to touch the stick. Don’t rush anything. And if the bird doesn’t respond - either return to an earlier stage or start again another day. Never use any force. Your aim is to get the bird feeling comfortable with something around her body. As soon as the bird will take a treat through the head loop, decrease the loop size and then place the harness on her back. Should the bird resist, leave off training and return to it some days later. Once you have the harness laid onto the body, give a nice treat. You need to be sensitive in judging the right moment to snap and close the clips (if you are using bulldog clips). Never attempt to force the harness onto the bird and shove treats at her. You’ll lose the battle. The bird will become more and more frightened and anxious and what was intended to be a sharing fun experience turns into one of alarm for the bird and dismay for you. When you have closed the snaps for bulldog clips or tightened the clasp for the Aviator, you can start walking round the house for short periods with the bird wearing its harness. Or you can rush straight outside. Personally, unless your bird is used to the immediate outside environment through going out into an aviary or a cage, I wouldn’t take her straight outside on the first occasion. Others recommend it. The Aviator is harder to train unless your bird can raise her wings quietly and without fuss. But once the bird accepts it, it is safer and lighter to use. I trained Benni macaw to wear a harness before he was weaned. Before I put it on him, I had taught him to raise his wings on request. Can an older bird be harness trained? I think they can - if you are willing to be patient and positive. You also need to have a bird that allows you to touch its body and under its wings. You need to have a bird that’s been trained to sit quietly on your hand or arm (or shoulder if you allow that). Without these pre-conditions, you could end up with the result, of which Steve Martin warned - of a bird that develops additional fears (and possibly a nasty bite from a frightened bird). The sure fire way of having a harness trained bird is to obtain a young bird that comes from a caring, helpful breeder. A chick who is handfed after 4-6 weeks will accept a harness easily, if it is put on when enough feathers are through and just before a formula feed. Artha and Casper were harness trained by Barrett Watson their breeder. And will both drop their heads years later to have the harness put on. How long can it take to harness train a parrot? With a mature bird, anything from a few weeks to a few months. The whole process involves a spending a lot of time; three months of daily work would be quite average for a parrot that did not fancy the idea. Ask yourself - have I got enough time? Birds learn at different rates; some take longer than others. Of the harness users I’ve spoken to, the cockatoo owners report a quicker and easier acceptance of harness than Greys and other birds. But you can see from the photos what a wide variety of birds can wear a harness. Failure to harness train a bird happens because most people give up too soon and don't train in small enough stages. Stick with it. Remember, for older birds it can take months of work to get her comfortable with wearing a harness. Which bird is easiest to harness train? Some species are easier to harness train than others. Many tame cockatoos love being handled and will raise their wings and let you put a harness on with the minimum of fuss. African Grey's and birds other than cockatoos can be harder to harness train. Lesser Sulphur Crested cockatoo Lily was a rescue bird. A friend was here asking for help with harnessing a Grey. Have you ever harnessed Lily? No, I hadn’t. However, Lily had seen the Greys wearing harness many times. ‘OK, let’s try,’ I said. I just talked sweetly to her and she let me harness her without any difficulty. 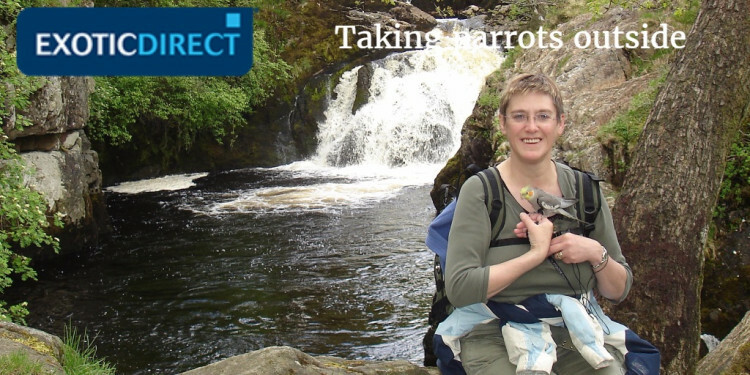 Now she is rehomed with Natalie Spencer and goes to visit the local primary school in her harness and Natalie talks about parrot conservation. Pitfalls to avoid are the bird getting into a panic and taking off with the harness half on and half off. If there’s an incident where harness training has gone wrong, keep calm and take it off. Give no treats and work on something else the bird likes to do with you. She will gradually learn to realise that the harness means lots of great treats if she cooperates! What are the risks of a parrot wearing a harness? Steve Martin, a professional trainer in Florida, said: “Anytime you use aversives with any animal you run the risk of the detrimental side effects: escape/avoidance, apathy, aggression, and phobia. What are the benefits of harness training? Barbara Heydenreich, the American parrot trainer wrote recently: “Whether your bird is fully lighted or clipped, it's natural to want a safe way to expose him to sun and fresh air, not to mention new people and places. Harnesses give birds an opportunity to engage in many types of experiences while at the same time reducing the risk. Bulldog clips (like Feather Tether): These work well for certain birds and are easier to put on. Be warned though - both my Greys learned after few uses how to undo the bulldog clips. The harness then fell to the ground. After this misadventure had happened several times, I stopped using bulldog harness and made my own with fishing tackle clips. Fiddly to make and hard to put on and take off. Homemade: I have seen some harnesses made with thin chain. These are homemade. I have never managed to make one but would still like to. Jubilee clip on leg (not recommended): These are put on the leg and are are used by some carers. We don’t recommend. They can be dangerous because a parrot’s leg isn’t as strong as a hawk's and if the bird spooks and flies off, the pressure on its leg can break it. Falconers use leg restraints but predators have much stronger leg bones. Aviator harnesses: These are the most popular harness. Artha can bite though them (my other birds do not) but before she has bitten through I have seen the damage she does. And even if she has severed a strap, her head is still held in the head loop. Artha Grey was 9 months old and on her first walk in our local woods. I had not secured the end of the leash, just holding it loosely in my hand. A crow spooked the young bird. She yanked the leash out of my hand and flew as high as she could get into the tip top of a 100-foot-high oak tree. Within minutes we had a group of eager bystanders giving unwanted advice. No way she could descend. Someone called the Fire Service. Within 30 minutes 8 stalwarts were clustered at the base of the tree. Artha panicked and tried to fly lower. The leash wrapped round a branch and she hung underneath swinging like a pendulum 30 foot above our heads. A quick-thinking fireman climbed the tree, sat in the fork and sawed off the branch from which she hung. She fell into my arms. Luckily, there was no physical damage. 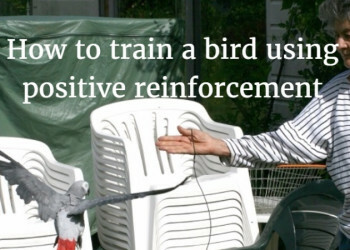 With time and lots of patience training your bird to wear a harness can be very successful. 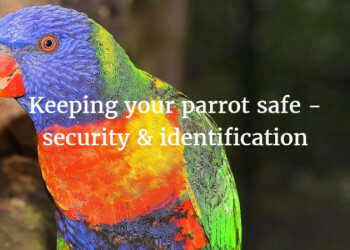 It can mean your bird is safe and secure on her outings, and that you relax. Good luck and happy outings!